The field of quantum computing is actually a sub-field of quantum information science, which includes quantum cryptography and quantum communication. Quantum Computing was started in the early 1980s when Richard Feynman and Yuri Manin expressed the idea that a quantum computer had the potential to simulate things that a classical computer could not. In 1994, Peter Shor shocked the world with an algorithm that had the potential to decrypt all secured communications. Qubits are fundamental to quantum computing and are somewhat analogous to bits in a classical computer. Qubits can be in a 1 or 0 quantum state. But they can also be in a superposition of the 1 and 0 states. However, when qubits are measured the result is always either a 0 or a 1; the probabilities of the two outcomes depends on the quantum state they were in. Today's physical quantum computers are very noisy and quantum error correction is a burgeoning field of research. Unfortunately existing hardware is so noisy that fault-tolerant quantum computing [is] still a rather distant dream. As of April 2019 neither large scalable quantum hardware has been demonstrated nor have commercially useful algorithms for today's small noisy quantum computers been published. There is an increasing amount of investment in quantum computing by governments, established companies, and start-ups . Both applications of near-term intermediate-scale devices  and the demonstration of quantum supremacy  are actively pursued in academic and industrial research. states at any one time). Quantum algorithms are often probabilistic, in that they provide the correct solution only with a certain known probability. Note that the term non-deterministic computing must not be used in that case to mean probabilistic (computing) because the term non-deterministic has a different meaning in computer science. ). This is true because any such system can be mapped onto an effective spin-1/2 system. A quantum computer with a given number of qubits is fundamentally different from a classical computer composed of the same number of classical bits. For example, representing the state of an n-qubit system on a classical computer requires the storage of 2n complex coefficients, while to characterize the state of a classical n-bit system it is sufficient to provide the values of the n bits, that is, only n numbers. Although this fact may seem to indicate that qubits can hold exponentially more information than their classical counterparts, care must be taken not to overlook the fact that the qubits are only in a probabilistic superposition of all of their states. This means that when the final state of the qubits is measured, they will only be found in one of the possible configurations they were in before the measurement. It is generally incorrect to think of a system of qubits as being in one particular state before the measurement. The qubits are in a superposition of states before any measurement is made, which directly affects the possible outcomes of the computation. different three-bit strings 000, 001, 010, 011, 100, 101, 110, and 111. If there is no uncertainty over its state, then it is in exactly one of these states with probability 1. However, if it is a probabilistic computer, then there is a possibility of it being in any one of a number of different states. -th state after a measurement. However, because a complex number encodes not just a magnitude but also a direction in the complex plane, the phase difference between any two coefficients (states) represents a meaningful parameter. This is a fundamental difference between quantum computing and probabilistic classical computing. and we say that the quantum state "collapses" to a classical state as a result of making the measurement. Integer factorization, which underpins the security of public key cryptographic systems, is believed to be computationally infeasible with an ordinary computer for large integers if they are the product of few prime numbers (e.g., products of two 300-digit primes). By comparison, a quantum computer could efficiently solve this problem using Shor's algorithm to find its factors. This ability would allow a quantum computer to break many of the cryptographic systems in use today, in the sense that there would be a polynomial time (in the number of digits of the integer) algorithm for solving the problem. In particular, most of the popular public key ciphers are based on the difficulty of factoring integers or the discrete logarithm problem, both of which can be solved by Shor's algorithm. In particular, the RSA, Diffie–Hellman, and elliptic curve Diffie–Hellman algorithms could be broken. These are used to protect secure Web pages, encrypted email, and many other types of data. Breaking these would have significant ramifications for electronic privacy and security. However, other cryptographic algorithms do not appear to be broken by those algorithms. Some public-key algorithms are based on problems other than the integer factorization and discrete logarithm problems to which Shor's algorithm applies, like the McEliece cryptosystem based on a problem in coding theory. Lattice-based cryptosystems are also not known to be broken by quantum computers, and finding a polynomial time algorithm for solving the dihedral hidden subgroup problem, which would break many lattice based cryptosystems, is a well-studied open problem. It has been proven that applying Grover's algorithm to break a symmetric (secret key) algorithm by brute force requires time equal to roughly 2n/2 invocations of the underlying cryptographic algorithm, compared with roughly 2n in the classical case, meaning that symmetric key lengths are effectively halved: AES-256 would have the same security against an attack using Grover's algorithm that AES-128 has against classical brute-force search (see Key size). Quantum cryptography could potentially fulfill some of the functions of public key cryptography. Quantum-based cryptographic systems could, therefore, be more secure than traditional systems against quantum hacking. Besides factorization and discrete logarithms, quantum algorithms offering a more than polynomial speedup over the best known classical algorithm have been found for several problems, including the simulation of quantum physical processes from chemistry and solid state physics, the approximation of Jones polynomials, and solving Pell's equation. No mathematical proof has been found that shows that an equally fast classical algorithm cannot be discovered, although this is considered unlikely. However, quantum computers offer polynomial speedup for some problems. The most well-known example of this is quantum database search, which can be solved by Grover's algorithm using quadratically fewer queries to the database than that are required by classical algorithms. In this case, the advantage is not only provable but also optimal, it has been shown that Grover's algorithm gives the maximal possible probability of finding the desired element for any number of oracle lookups. 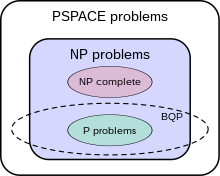 Several other examples of provable quantum speedups for query problems have subsequently been discovered, such as for finding collisions in two-to-one functions and evaluating NAND trees. For problems with all these properties, the running time of Grover's algorithm on a quantum computer will scale as the square root of the number of inputs (or elements in the database), as opposed to the linear scaling of classical algorithms. A general class of problems to which Grover's algorithm can be applied  is Boolean satisfiability problem. In this instance, the database through which the algorithm is iterating is that of all possible answers. An example (and possible) application of this is a password cracker that attempts to guess the password or secret key for an encrypted file or system. Symmetric ciphers such as Triple DES and AES are particularly vulnerable to this kind of attack. This application of quantum computing is a major interest of government agencies. Adiabatic quantum computation relies on the adiabatic theorem to undertake calculations. A system is placed in the ground state for a simple Hamiltonian, which is slowly evolved to a more complicated Hamiltonian whose ground state represents the solution to the problem in question. The adiabatic theorem states that if the evolution is slow enough the system will stay in its ground state at all times through the process. The Quantum algorithm for linear systems of equations or "HHL Algorithm", named after its discoverers Harrow, Hassidim, and Lloyd, is expected to provide speedup over classical counterparts. John Preskill has introduced the term quantum supremacy to refer to the hypothetical speedup advantage that a quantum computer would have over a classical computer in a certain field. Google announced in 2017 that it expected to achieve quantum supremacy by the end of the year though that did not happen. IBM said in 2018 that the best classical computers will be beaten on some practical task within about five years and views the quantum supremacy test only as a potential future benchmark. Quantum supremacy has not been achieved yet, and skeptics like Gil Kalai doubt that it will ever be. Bill Unruh doubted the practicality of quantum computers in a paper published back in 1994. Paul Davies argued that a 400-qubit computer would even come into conflict with the cosmological information bound implied by the holographic principle. One of the greatest challenges is controlling or removing quantum decoherence. This usually means isolating the system from its environment as interactions with the external world cause the system to decohere. However, other sources of decoherence also exist. Examples include the quantum gates, and the lattice vibrations and background thermonuclear spin of the physical system used to implement the qubits. Decoherence is irreversible, as it is effectively non-unitary, and is usually something that should be highly controlled, if not avoided. Decoherence times for candidate systems in particular, the transverse relaxation time T2 (for NMR and MRI technology, also called the dephasing time), typically range between nanoseconds and seconds at low temperature. Currently, some quantum computers require their qubits to be cooled to 20 millikelvins in order to prevent significant decoherence. As a result, time-consuming tasks may render some quantum algorithms inoperable, as maintaining the state of qubits for a long enough duration will eventually corrupt the superpositions. As described in the Quantum threshold theorem, if the error rate is small enough, it is thought to be possible to use quantum error correction to suppress errors and decoherence. This allows the total calculation time to be longer than the decoherence time if the error correction scheme can correct errors faster than decoherence introduces them. An often cited figure for the required error rate in each gate for fault-tolerant computation is 10−3, assuming the noise is depolarizing. Meeting this scalability condition is possible for a wide range of systems. However, the use of error correction brings with it the cost of a greatly increased number of required qubits. The number required to factor integers using Shor's algorithm is still polynomial, and thought to be between L and L2, where L is the number of qubits in the number to be factored; error correction algorithms would inflate this figure by an additional factor of L. For a 1000-bit number, this implies a need for about 104 bits without error correction. With error correction, the figure would rise to about 107 bits. Computation time is about L2 or about 107 steps and at 1 MHz, about 10 seconds. The quantum Turing machine is theoretically important but the direct implementation of this model is not pursued. All four models of computation have been shown to be equivalent; each can simulate the other with no more than polynomial overhead. A large number of candidates demonstrates that the topic, in spite of rapid progress, is still in its infancy. There is also a vast amount of flexibility. In 1959, Richard Feynman, in his lecture "There's Plenty of Room at the Bottom", states the possibility of using quantum effects for computation. In 1980, Paul Benioff described quantum mechanical Hamiltonian models of computers and the Russian mathematician Yuri Manin motivated the development of quantum computers. In 1981, at a conference co-organized by MIT and IBM, physicist Richard Feynman urged the world to build a quantum computer. He said, "Nature isn't classical, dammit, and if you want to make a simulation of nature, you'd better make it quantum mechanical, and by golly, it's a wonderful problem because it doesn't look so easy." In 1984, IBM scientists Charles Bennett and Gilles Brassard published BB84, the world's first quantum cryptography protocol. In 1985, David Deutsch describes the first universal quantum computer. Just as a Universal Turing machine can simulate any other Turing machine efficiently (Church-Turing thesis), so the universal quantum computer is able to simulate any other quantum computer with at most a polynomial slowdown. In 1992, David Deutsch and Richard Jozsa propose a computational problem that can be solved efficiently with the determinist Deutsch–Jozsa algorithm on a quantum computer, but for which no deterministic classical algorithm is possible. This was perhaps the earliest result in the computational complexity of quantum computers, proving that they were capable of performing some well-defined computational task more efficiently than any classical computer. In 1993, an international group of six scientists, including Charles Bennett, showed that perfect quantum teleportation is possible in principle, but only if the original is destroyed. In 1994, Peter Shor, at AT&T's Bell Labs, discovered an important quantum algorithm, which allows a quantum computer to factor large integers exponentially much faster than the best known classical algorithm. Shor's algorithm can theoretically break many of the Public-key cryptography systems in use today, sparking a tremendous interest in quantum computers. In 1996, the DiVincenzo's criteria are published, which are a list of conditions that are necessary for constructing a quantum computer, proposed by the theoretical physicist David P. DiVincenzo in his 2000 paper "The Physical Implementation of Quantum Computation". In 2005, researchers at the University of Michigan built a semiconductor chip ion trap. Such devices from standard lithography may point the way to scalable quantum computing. In 2009, researchers at Yale University created the first solid-state quantum processor. The 2-qubit superconducting chip had artificial atom qubits made of a billion aluminum atoms that acted like a single atom that could occupy two states. A team at the University of Bristol also created a silicon chip based on quantum optics, able to run Shor's algorithm. Further developments were made in 2010. Springer publishes a journal, Quantum Information Processing, devoted to the subject. In February 2010, Digital Combinational Circuits like an adder, subtractor etc. are designed with the help of Symmetric Functions organized from different quantum gates. In April 2011, a team of scientists from Australia and Japan made a breakthrough in quantum teleportation, successfully transferring a complex set of quantum data with full transmission integrity, without affecting the qubits' superpositions. Photograph of a chip constructed by D-Wave Systems Inc. Mounted and wire-bonded in a sample holder. The D-Wave processor is designed to use 128 superconducting logic elements that exhibit controllable and tunable coupling to perform operations. In 2011, D-Wave Systems announced the first commercial quantum annealer, the D-Wave One, claiming a 128-qubit processor. On 25 May 2011, Lockheed Martin agreed to purchase a D-Wave One system. Lockheed and the University of Southern California (USC) will house the D-Wave One at the newly formed USC Lockheed Martin Quantum Computing Center. D-Wave's engineers designed the chips with an empirical approach, focusing on solving particular problems. Investors liked this more than academics, who said D-Wave had not demonstrated that they really had a quantum computer. Criticism softened after a D-Wave paper in Nature that proved that the chips have some quantum properties. Two published papers have suggested that the D-Wave machine's operation can be explained classically, rather than requiring quantum models. Later work showed that classical models are insufficient when all available data is considered. Experts remain divided on the ultimate classification of the D-Wave systems though their quantum behavior was established concretely with a demonstration of entanglement. In September 2011, researchers proved quantum computers can be made with a Von Neumann architecture (separation of RAM). In November 2011, researchers factorized 143 using 4 qubits. In February 2012, IBM scientists said that they had made several breakthroughs in quantum computing with superconducting integrated circuits. In April 2012, a multinational team of researchers from the University of Southern California, the Delft University of Technology, the Iowa State University of Science and Technology, and the University of California, Santa Barbara constructed a 2-qubit quantum computer on a doped diamond crystal that can easily be scaled up and is functional at room temperature. Two logical qubit directions of electron spin and nitrogen kernels spin were used, with microwave impulses. This computer ran Grover's algorithm, generating the right answer on the first try in 95% of cases. In September 2012, Australian researchers at the University of New South Wales said the world's first quantum computer was just 5 to 10 years away, after announcing a global breakthrough enabling the manufacture of its memory building blocks. A research team led by Australian engineers created the first working qubit based on a single atom in silicon, invoking the same technological platform that forms the building blocks of modern-day computers. In October 2012, Nobel Prizes were awarded to David J. Wineland and Serge Haroche for their basic work on understanding the quantum world, which may help make quantum computing possible. In November 2012, the first quantum teleportation from one macroscopic object to another was reported by scientists at the University of Science and Technology of China. In December 2012, 1QBit, the first dedicated quantum computing software company, was founded in Vancouver, BC. 1QBit is the first company to focus exclusively on commercializing software applications for commercially available quantum computers, including the D-Wave Two. 1QBit's research demonstrated the ability of superconducting quantum annealing processors to solve real-world problems. In February 2013, a new technique, boson sampling, was reported by two groups using photons in an optical lattice that is not a universal quantum computer, but may be good enough for practical problems. In May 2013, Google announced that it was launching the Quantum Artificial Intelligence Lab, hosted by NASA's Ames Research Center, with a 512-qubit D-Wave quantum computer. The Universities Space Research Association (USRA) will invite researchers to share time on it with the goal of studying quantum computing for machine learning. Google added that they had "already developed some quantum machine learning algorithms" and had "learned some useful principles", such as that "best results" come from "mixing quantum and classical computing". In early 2014, based on documents provided by former NSA contractor Edward Snowden, it was reported that the U.S. National Security Agency (NSA) is running a $79.7 million research program titled "Penetrating Hard Targets", to develop a quantum computer capable of breaking vulnerable encryption. In 2014, a group of researchers from ETH Zürich, USC, Google, and Microsoft reported a definition of quantum speedup, and were not able to measure quantum speedup with the D-Wave Two device, but did not explicitly rule it out. In 2014, researchers at University of New South Wales used silicon as a protectant shell around qubits, making them more accurate, increasing the length of time they will hold information, and possibly making quantum computers easier to build. In April 2015, IBM scientists claimed two critical advances towards the realization of a practical quantum computer, claiming the ability to detect and measure both kinds of quantum errors simultaneously, as well as a new, square quantum bit circuit design that could scale to larger dimensions. In October 2015, QuTech successfully conducted the Loophole-free Bell inequality violation test using electron spins separated by 1.3 kilometres. In October 2015, researchers at the University of New South Wales built a quantum logic gate in silicon for the first time. In December 2015, NASA publicly displayed the world's first fully operational quantum computer made D-Wave Systems at the Quantum Artificial Intelligence Lab at its Ames Research Center. The device was purchased in 2013 via a partnership with Google and Universities Space Research Association. The presence and use of quantum effects in the D-Wave quantum processing unit is more widely accepted. In some tests, it can be shown that the D-Wave quantum annealing processor outperforms Selby’s algorithm. Only two of these computers have been made so far. In May 2016, IBM Research announced that for the first time ever it is making quantum computing available to members of the public via the cloud, who can access and run experiments on IBM’s quantum processor, calling the service the IBM Quantum Experience. The quantum processor is composed of five superconducting qubits and is housed at IBM's Thomas J. Watson Research Center. In October 2016, the University of Basel described a variant of the electron-hole based quantum computer, which instead of manipulating electron spins, uses electron holes in a semiconductor at low (mK) temperatures, which are much less vulnerable to decoherence. This has been dubbed the "positronic" quantum computer, as the quasi-particle behaves as if it has a positive electrical charge. In March 2017, IBM announced an industry-first initiative, called IBM Q, to build commercially available universal quantum computing systems. The company also released a new API for the IBM Quantum Experience that enables developers and programmers to begin building interfaces between its existing 5-qubit cloud-based quantum computer and classical computers, without needing a deep background in quantum physics. In May 2017, IBM announced that it had successfully built and tested its most powerful universal quantum computing processors. The first is a 16-qubit processor that will allow for more complex experimentation than the previously available 5-qubit processor. The second is IBM's first prototype commercial processor with 17 qubits, and leverages significant materials, device, and architecture improvements to make it the most powerful quantum processor created to date by IBM. In July 2017, a group of U.S. researchers announced a quantum simulator with 51 qubits. The announcement was made by Mikhail Lukin of Harvard University at the International Conference on Quantum Technologies in Moscow. A quantum simulator differs from a computer. Lukin’s simulator was designed to solve one equation. Solving a different equation would require building a new system, whereas a computer can solve many different equations. In September 2017, IBM Research scientists used a 7-qubit device to model beryllium hydride molecule, the largest molecule to date by a quantum computer. The results were published as the cover story in the peer-reviewed journal Nature. In October 2017, IBM Research scientists successfully "broke the 49-qubit simulation barrier" and simulated 49- and 56-qubit short-depth circuits, using the Lawrence Livermore National Laboratory's Vulcan supercomputer, and the University of Illinois' Cyclops Tensor Framework (originally developed at the University of California). In November 2017, the University of Sydney research team successfully made a microwave circulator, an important quantum computer part, that was 1000 times smaller than a conventional circulator, by using topological insulators to slow down the speed of light in a material. In December 2017, IBM announced its first IBM Q Network clients. The companies, universities, and labs that will explore practical business and science quantum applications, using IBM Q 20-qubit commercial systems, include: JPMorgan Chase, Daimler AG, Samsung, JSR Corporation, Barclays, Hitachi Metals, Honda, Nagase, Keio University, Oak Ridge National Lab, Oxford University and University of Melbourne. In December 2017, Microsoft released a preview version of a "Quantum Development Kit",  which includes a programming language, Q# that can be used to write programs that are run on an emulated quantum computer. In 2017, D-Wave was reported to be selling a 2,000-qubit quantum computer. In late 2017 and early 2018, IBM, Intel, and Google each reported testing quantum processors containing 50, 49, and 72 qubits, respectively, all realized using superconducting circuits. By number of qubits, these circuits are approaching the range in which simulating their quantum dynamics is expected to become prohibitive on classical computers, although it has been argued that further improvements in error rates are needed to put classical simulation out of reach. In February 2018, QuTech reported successfully testing a silicon-based two-spin-qubits quantum processor. In June 2018, Intel began testing a silicon-based spin-qubit processor, manufactured in the company's D1D Fab in Oregon. In July 2018, a team led by the University of Sydney achieved the world's first multi-qubit demonstration of a quantum chemistry calculation performed on a system of trapped ions, one of the leading hardware platforms in the race to develop a universal quantum computer. In December 2018, IonQ reported that its machine could be built as large as 160 qubits. In January 2019, IBM launched IBM Q System One, its first integrated quantum computing system for commercial use. IBM Q System One is designed by industrial design company Map Project Office and interior design company Universal Design Studio. In March 2019, a group of Russian scientists used the open-access IBM quantum computer to demonstrate a protocol for the complex conjugation of the probability amplitudes needed for time reversal of a physical process, in this case, for an electron scattered on a two-level impurity, a two-qubit experiment. However, for the three-qubit experiment, the amplitude fell below 50% (failure of time reversal, due to its increased complexity). steps taken by Grover's algorithm. Neither search method will allow quantum computers to solve NP-Complete problems in polynomial time. Although quantum computers may be faster than classical computers for some problem types, those described above cannot solve any problem that classical computers cannot already solve. A Turing machine can simulate these quantum computers, so such a quantum computer could never solve an undecidable problem like the halting problem. The existence of "standard" quantum computers does not disprove the Church–Turing thesis. It has been speculated that theories of quantum gravity, such as M-theory or loop quantum gravity, may allow even faster computers to be built. Currently, defining computation in such theories is an open problem due to the problem of time, i.e., there currently exists no obvious way to describe what it means for an observer to submit input to a computer and later receive output. ^ Feynman, Richard (June 1982). "Simulating Physics with Computers" (PDF). International Journal of Theoretical Physics. 21 (6/7): 467–488. doi:10.1007/BF02650179. Retrieved 28 February 2019. ^ Mermin, David (March 28, 2006). "Breaking RSA Encryption with a Quantum Computer: Shor's Factoring Algorithm" (PDF). Cornell University, Physics 481-681 Lecture Notes. ^ a b John Preskill (2018). "Quantum Computing in the NISQ era and beyond". Quantum. 2: 79. arXiv:1801.00862. doi:10.22331/q-2018-08-06-79. ^ "Quantum Computing Report: Players". Retrieved 2019-04-17. ^ John Preskill. "Quantum computing and the entanglement frontier". arXiv:1203.5813. ^ a b c Nielsen, Michael A.; Chuang, Isaac L. (2010). Quantum Computation and Quantum Information (2nd ed.). Cambridge: Cambridge University Press. ISBN 978-1-107-00217-3. ^ Preskill, John (2015). "Lecture Notes for Ph219/CS219: Quantum Information Chapter 5" (PDF). p. 12. ^ Waldner, Jean-Baptiste (2007). Nanocomputers and Swarm Intelligence. London: ISTE. p. 157. ISBN 978-2-7462-1516-0. ^ Lenstra, Arjen K. (2000). "Integer Factoring" (PDF). Designs, Codes and Cryptography. 19 (2/3): 101–128. doi:10.1023/A:1008397921377. Archived from the original (PDF) on 2015-04-10. ^ See also pqcrypto.org, a bibliography maintained by Daniel J. Bernstein and Tanja Lange on cryptography not known to be broken by quantum computing. ^ Bennett C.H., Bernstein E., Brassard G., Vazirani U., "The strengths and weaknesses of quantum computation". SIAM Journal on Computing 26(5): 1510–1523 (1997). ^ "What are quantum computers and how do they work? WIRED explains". Wired UK. 2018-02-16. ^ Jon Schiller, Phd (2009-06-19). Quantum Computers. ISBN 9781439243497. ^ Ambainis, Andris (2005). "Quantum search algorithms". arXiv:quant-ph/0504012. ^ Mavroeidis, Vasileios; Vishi, Kamer; d, Mateusz; Jøsang, Audun (March 2018). "The Impact of Quantum Computing on Present Cryptography". International Journal of Advanced Computer Science and Applications. 9 (3). arXiv:1804.00200. doi:10.14569/IJACSA.2018.090354. ^ Rich, Steven; Gellman, Barton (2014-02-01). "NSA seeks to build quantum computer that could crack most types of encryption". Washington Post. ^ Norton, Quinn (2007-02-15). "The Father of Quantum Computing". Wired. ^ Ambainis, Andris (Spring 2014). "What Can We Do with a Quantum Computer?". Institute for Advanced Study. ^ Ambainis, Andris; Hassidim, Avinatan; Lloyd, Seth (2008). "Quantum algorithm for solving linear systems of equations". Physical Review Letters. 103 (15): 150502. arXiv:0811.3171. doi:10.1103/PhysRevLett.103.150502. PMID 19905613. ^ Boixo, Sergio; Isakov, Sergei V.; Smelyanskiy, Vadim N.; Babbush, Ryan; Ding, Nan; Jiang, Zhang; Bremner, Michael J.; Martinis, John M.; Neven, Hartmut (2018). "Characterizing Quantum Supremacy in Near-Term Devices". Nature Physics. 14 (6): 595–600. arXiv:1608.00263. doi:10.1038/s41567-018-0124-x. ^ Savage, Neil. "Quantum Computers Compete for "Supremacy"". ^ "Quantum Supremacy and Complexity". 23 April 2016. ^ Kalai, Gil. "The Quantum Computer Puzzle" (PDF). AMS. ^ Unruh, Bill (1995). "Maintaining coherence in Quantum Computers". Physical Review A. 51 (2): 992–997. arXiv:hep-th/9406058. Bibcode:1995PhRvA..51..992U. doi:10.1103/PhysRevA.51.992. ^ Davies, Paul. "The implications of a holographic universe for quantum information science and the nature of physical law" (PDF). Macquarie University. ^ DiVincenzo, David P. (2000-04-13). "The Physical Implementation of Quantum Computation". Fortschritte der Physik. 48 (9–11): 771–783. arXiv:quant-ph/0002077. Bibcode:2000ForPh..48..771D. doi:10.1002/1521-3978(200009)48:9/11<771::AID-PROP771>3.0.CO;2-E.
^ Jones, Nicola (19 June 2013). "Computing: The quantum company". Nature. 498 (7454): 286–288. Bibcode:2013Natur.498..286J. doi:10.1038/498286a. PMID 23783610. ^ Amy, Matthew; Matteo, Olivia; Gheorghiu, Vlad; Mosca, Michele; Parent, Alex; Schanck, John (November 30, 2016). "Estimating the cost of generic quantum pre-image attacks on SHA-2 and SHA-3". arXiv:1603.09383 [quant-ph]. ^ Dyakonov, M. I. (2006-10-14). S. Luryi; J. Xu; A. Zaslavsky (eds.). "Is Fault-Tolerant Quantum Computation Really Possible?". Future Trends in Microelectronics. Up the Nano Creek: 4–18. arXiv:quant-ph/0610117. Bibcode:2006quant.ph.10117D. ^ Freedman, Michael H.; Kitaev, Alexei; Larsen, Michael J.; Wang, Zhenghan (2003). "Topological quantum computation". Bulletin of the American Mathematical Society. 40 (1): 31–38. arXiv:quant-ph/0101025. doi:10.1090/S0273-0979-02-00964-3. MR 1943131. ^ Monroe, Don (2008-10-01). "Anyons: The breakthrough quantum computing needs?". New Scientist. ^ Das, A.; Chakrabarti, B. K. (2008). "Quantum Annealing and Analog Quantum Computation". Rev. Mod. Phys. 80 (3): 1061–1081. arXiv:0801.2193. Bibcode:2008RvMP...80.1061D. CiteSeerX 10.1.1.563.9990. doi:10.1103/RevModPhys.80.1061. ^ Nayak, Chetan; Simon, Steven; Stern, Ady; Das Sarma, Sankar (2008). "Nonabelian Anyons and Quantum Computation". Rev Mod Phys. 80 (3): 1083–1159. arXiv:0707.1889. Bibcode:2008RvMP...80.1083N. doi:10.1103/RevModPhys.80.1083. ^ Clarke, John; Wilhelm, Frank (June 19, 2008). "Superconducting quantum bits". Nature. 453 (7198): 1031–1042. Bibcode:2008Natur.453.1031C. doi:10.1038/nature07128. PMID 18563154. ^ Kaminsky, William M (2004). "Scalable Superconducting Architecture for Adiabatic Quantum Computation". arXiv:quant-ph/0403090. ^ Imamoğlu, Atac; Awschalom, D. D.; Burkard, Guido; DiVincenzo, D. P.; Loss, D.; Sherwin, M.; Small, A. (1999). "Quantum information processing using quantum dot spins and cavity-QED". Physical Review Letters. 83 (20): 4204–4207. arXiv:quant-ph/9904096. Bibcode:1999PhRvL..83.4204I. doi:10.1103/PhysRevLett.83.4204. ^ Fedichkin, Leonid; Yanchenko, Maxim; Valiev, Kamil (2000). "Novel coherent quantum bit using spatial quantization levels in semiconductor quantum dot". Quantum Computers and Computing. 1: 58–76. arXiv:quant-ph/0006097. Bibcode:2000quant.ph..6097F. Archived from the original on 2011-08-18. ^ Bertoni, A.; Bordone, P.; Brunetti, R.; Jacoboni, C.; Reggiani, S. (2000-06-19). "Quantum Logic Gates based on Coherent Electron Transport in Quantum Wires". Physical Review Letters. 84 (25): 5912–5915. Bibcode:2000PhRvL..84.5912B. doi:10.1103/PhysRevLett.84.5912. PMID 10991086. ^ Ionicioiu, Radu; Amaratunga, Gehan; Udrea, Florin (2001-01-20). "Quantum Computation with Ballistic Electrons". International Journal of Modern Physics B. 15 (2): 125–133. arXiv:quant-ph/0011051. Bibcode:2001IJMPB..15..125I. doi:10.1142/s0217979201003521. ISSN 0217-9792. ^ Ramamoorthy, A.; Bird, J. P.; Reno, J. L. (2007). "Using split-gate structures to explore the implementation of a coupled-electron-waveguide qubit scheme". Journal of Physics: Condensed Matter. 19 (27): 276205. Bibcode:2007JPCM...19A6205R. doi:10.1088/0953-8984/19/27/276205. ISSN 0953-8984. ^ Leuenberger, MN; Loss, D (Apr 12, 2001). "Quantum computing in molecular magnets". Nature. 410 (6830): 789–93. arXiv:cond-mat/0011415. Bibcode:2001Natur.410..789L. doi:10.1038/35071024. PMID 11298441. ^ Knill, G. J.; Laflamme, R.; Milburn, G. J. (2001). "A scheme for efficient quantum computation with linear optics". Nature. 409 (6816): 46–52. Bibcode:2001Natur.409...46K. doi:10.1038/35051009. PMID 11343107. ^ Nizovtsev, A. P. (August 2005). "A quantum computer based on NV centers in diamond: Optically detected nutations of single electron and nuclear spins". Optics and Spectroscopy. 99 (2): 248–260. Bibcode:2005OptSp..99..233N. doi:10.1134/1.2034610. ^ Gruener, Wolfgang (2007-06-01). "Research indicates diamonds could be key to quantum storage". Archived from the original on 2007-06-04. Retrieved 2007-06-04. ^ Neumann, P.; et al. (June 6, 2008). "Multipartite Entanglement Among Single Spins in Diamond". Science. 320 (5881): 1326–1329. Bibcode:2008Sci...320.1326N. doi:10.1126/science.1157233. PMID 18535240. ^ Millman, Rene (2007-08-03). "Trapped atoms could advance quantum computing". ITPro. Archived from the original on 2007-09-27. Retrieved 2007-07-26. ^ Ohlsson, N.; Mohan, R. K.; Kröll, S. (January 1, 2002). "Quantum computer hardware based on rare-earth-ion-doped inorganic crystals". Opt. Commun. 201 (1–3): 71–77. Bibcode:2002OptCo.201...71O. doi:10.1016/S0030-4018(01)01666-2. ^ Longdell, J. J.; Sellars, M. J.; Manson, N. B. (September 23, 2004). "Demonstration of conditional quantum phase shift between ions in a solid". Phys. Rev. Lett. 93 (13): 130503. arXiv:quant-ph/0404083. Bibcode:2004PhRvL..93m0503L. doi:10.1103/PhysRevLett.93.130503. PMID 15524694. ^ Náfrádi, Bálint; Choucair, Mohammad; Dinse, Klaus-Peter; Forró, László (July 18, 2016). "Room Temperature manipulation of long lifetime spins in metallic-like carbon nanospheres". Nature Communications. 7: 12232. arXiv:1611.07690. Bibcode:2016NatCo...712232N. doi:10.1038/ncomms12232. PMC 4960311. PMID 27426851. ^ Manin, Yu I (1980). "Vychislimoe i nevychislimoe" [Computable and Noncomputable]. Sov.Radio (in Russian). pp. 13–15. Archived from the original on May 10, 2013. Retrieved October 20, 2017. ^ Gil, Dario (May 4, 2016). "The Dawn of Quantum Computing is Upon Us". Retrieved May 4, 2016. ^ Bennett, C. H. (29 March 1993). "Teleporting an unknown quantum state via dual classical and Einstein–Podolsky–Rosen channels" (PDF). Physical Review Letters. 70 (13): 1895–1899. Bibcode:1993PhRvL..70.1895B. doi:10.1103/PhysRevLett.70.1895. PMID 10053414. ^ Ekert, Artur; Josza, Richard (1996). "Quantum computation and Shor's factoring algorithm". Rev. Mod. Phys. 68 (3): 733–753. doi:10.1103/RevModPhys.68.733. ^ Vandersypen, Lieven M. K.; Steffen, Matthias; Breyta, Gregory; Yannoni, Costantino S.; Sherwood, Mark H.; Chuang, Isaac L. (2001). "Experimental realization of Shor's quantum factoring algorithm using nuclear magnetic resonance". Nature. 414 (6866): 883–7. arXiv:quant-ph/0112176. Bibcode:2001Natur.414..883V. CiteSeerX 10.1.1.251.8799. doi:10.1038/414883a. PMID 11780055. ^ "U-M develops scalable and mass-producible quantum computer chip". University of Michigan. 2005-12-12. Retrieved 2006-11-17. ^ DiCarlo, L.; Chow, J. M.; Gambetta, J. M.; Bishop, Lev S.; Johnson, B. R.; Schuster, D. I.; Majer, J.; Blais, A.; Frunzio, L.; S. M. Girvin; R. J. Schoelkopf (9 July 2009). "Demonstration of 2-qubit algorithms with a superconducting quantum processor" (PDF). Nature. 460 (7252): 240–4. arXiv:0903.2030. Bibcode:2009Natur.460..240D. doi:10.1038/nature08121. PMID 19561592. Retrieved 2009-07-02. ^ "Scientists Create First Electronic Quantum Processor". Yale University. 2009-07-02. Archived from the original on 2010-06-11. Retrieved 2009-07-02. ^ "Code-breaking quantum algorithm runs on a silicon chip". New Scientist. 2009-09-04. Retrieved 2009-10-14. ^ "New Trends in Quantum Computation". Simons Conference on New Trends in Quantum Computation 2010: Program. C.N. Yang Institute for Theoretical Physics. ^ "Quantum Information Processing". Springer.com. Retrieved on 2011-05-19. ^ Bhattacharjee, Pijush Kanti (2010). "Digital Combinational Circuits Design by QCA Gates" (PDF). International Journal of Computer and Electrical Engineering. 2 (1): 67–72. ^ Bhattacharjee, Pijush Kanti (2010). "Digital Combinational Circuits Design with the Help of Symmetric Functions Considering Heat Dissipation by Each QCA Gate" (PDF). International Journal of Computer and Electrical Engineering. 2 (4): 666–672. ^ "Quantum teleporter breakthrough". University of New South Wales. 2011-04-15. Archived from the original on 2011-04-18. ^ Lai, Richard (2011-04-18). "First light wave quantum teleportation achieved, opens door to ultra fast data transmission". Engadget. ^ a b "D-Wave Systems sells its first Quantum Computing System to Lockheed Martin Corporation". D-Wave. 2011-05-25. Retrieved 2011-05-30. ^ "Operational Quantum Computing Center Established at USC". University of Southern California. 2011-10-29. Retrieved 2011-12-06. ^ Johnson, M. W.; Amin, M. H. S.; Gildert, S.; Lanting, T.; Hamze, F.; Dickson, N.; Harris, R.; Berkley, A. J.; Johansson, J.; Bunyk, P.; Chapple, E. M.; Enderud, C.; Hilton, J. P.; Karimi, K.; Ladizinsky, E.; Ladizinsky, N.; Oh, T.; Perminov, I.; Rich, C.; Thom, M. C.; Tolkacheva, E.; Truncik, C. J. S.; Uchaikin, S.; Wang, J.; Wilson, B.; Rose, G. (12 May 2011). "Quantum annealing with manufactured spins". Nature. 473 (7346): 194–198. Bibcode:2011Natur.473..194J. doi:10.1038/nature10012. PMID 21562559. ^ Simonite, Tom (October 4, 2012). "The CIA and Jeff Bezos Bet on Quantum Computing". Technology Review. ^ Seung Woo Shin; Smith, Graeme; Smolin, John A.; Vazirani, Umesh (2014-05-02). "How "Quantum" is the D-Wave Machine?". arXiv:1401.7087 [quant-ph]. ^ Boixo, Sergio; Rønnow, Troels F.; Isakov, Sergei V.; Wang, Zhihui; Wecker, David; Lidar, Daniel A.; Martinis, John M.; Troyer, Matthias (2014). "Quantum Annealing With More Than 100 Qbits". Nature Physics. 10 (3): 218–224. arXiv:1304.4595. Bibcode:2014NatPh..10..218B. doi:10.1038/nphys2900. ^ Albash, Tameem; Rønnow, Troels F.; Troyer, Matthias; Lidar, Daniel A. (2014-09-12). "Reexamining classical and quantum models for the D-Wave One processor". The European Physical Journal Special Topics. 224 (111): 111–129. arXiv:1409.3827. Bibcode:2015EPJST.224..111A. doi:10.1140/epjst/e2015-02346-0. ^ Lanting, T.; Przybysz, A. J.; Smirnov, A. Yu. ; Spedalieri, F. M.; Amin, M. H.; Berkley, A. J.; Harris, R.; Altomare, F.; Boixo, S.; Bunyk, P.; Dickson, N.; Enderud, C.; Hilton, J. P.; Hoskinson, E.; Johnson, M. W.; Ladizinsky, E.; Ladizinsky, N.; Neufeld, R.; Oh, T.; Perminov, I.; Rich, C.; Thom, M. C.; Tolkacheva, E.; Uchaikin, S.; Wilson, A. B.; Rose, G. (2014-05-29). "Entanglement in a quantum annealing processor". Physical Review X. 4 (2): 021041. arXiv:1401.3500. Bibcode:2014PhRvX...4b1041L. doi:10.1103/PhysRevX.4.021041. ^ Lopez, Enrique Martin; Laing, Anthony; Lawson, Thomas; Alvarez, Roberto; Zhou, Xiao-Qi; O'Brien, Jeremy L. (2012). "Implementation of an iterative quantum order finding algorithm". Nature Photonics. 6 (11): 773–776. arXiv:1111.4147. Bibcode:2012NaPho...6..773M. doi:10.1038/nphoton.2012.259. ^ Mariantoni, Matteo; Wang, H.; Yamamoto, T.; Neeley, M.; Bialczak, Radoslaw C.; Chen, Y.; Lenander, M.; Lucero, Erik; O'Connell, A. D.; Sank, D.; Weides, M.; Wenner, J.; Yin, Y.; Zhao, J.; Korotkov, A. N.; Cleland, A. N.; Martinis, John M. (2011). "Quantum computer with Von Neumann architecture". Science. 334 (6052): 61–65. arXiv:1109.3743. Bibcode:2011Sci...334...61M. doi:10.1126/science.1208517. PMID 21885732. ^ Xu, Nanyang; Zhu, Jing; Lu, Dawei; Zhou, Xianyi; Peng, Xinhua; Du, Jiangfeng (2011). "Quantum Factorization of 143 on a Dipolar-Coupling NMR system". Physical Review Letters. 109 (26): 269902. arXiv:1111.3726. Bibcode:2012PhRvL.109z9902X. doi:10.1103/PhysRevLett.109.269902. ^ "IBM Says It's 'On the Cusp' of Building a Quantum Computer". PCMAG. Retrieved 2014-10-26. ^ "Quantum computer built inside diamond". Futurity. 2012-04-09. Retrieved 2014-10-26. ^ "Australian engineers write quantum computer 'qubit' in global breakthrough". The Australian. Retrieved 2012-10-03. ^ "Breakthrough in bid to create first quantum computer". University of New South Wales. 2012-09-19. Retrieved 2012-10-03. ^ Frank, Adam (October 14, 2012). "Cracking the Quantum Safe". The New York Times. Retrieved 2012-10-14. ^ Overbye, Dennis (October 9, 2012). "A Nobel for Teasing Out the Secret Life of Atoms". The New York Times. Retrieved 2012-10-14. ^ "First Teleportation from One Macroscopic Object to Another: The Physics arXiv Blog". MIT Technology Review. November 15, 2012. Retrieved 2012-11-17. ^ Bao, Xiao-Hui; Xu, Xiao-Fan; Li, Che-Ming; Yuan, Zhen-Sheng; Lu, Chao-Yang; Pan, Jian-wei (November 13, 2012). "Quantum teleportation between remote atomic-ensemble quantum memories". Proceedings of the National Academy of Sciences. 109 (50): 20347–20351. arXiv:1211.2892. Bibcode:2012PNAS..10920347B. doi:10.1073/pnas.1207329109. PMC 3528515. PMID 23144222. ^ "1QBit Founded". 1QBit.com. Archived from the original on 2014-06-19. Retrieved 2014-06-22. ^ "1QBit Research". 1QBit.com. Archived from the original on 2014-06-19. Retrieved 2014-06-22. ^ Spring, Justin; Metcalf, Benjamin; Humphreys, Peter; Kolthammer, Steven; Jin, Xian-Min; Barbieri, Marco; Datta, Animesh; Thomas-Peter, Nicholas; Langford, Nathan; Kundys, Dmytro; Gates, James; Smith, Brian; Smith, Peter; Walmsley, Ian (2013). "Boson sampling on a photonic chip". Science. 339 (6121): 798–801. arXiv:1212.2622. Bibcode:2013Sci...339..798S. doi:10.1126/science.1231692. PMID 23258407. ^ a b "Launching the Quantum Artificial Intelligence Lab". Research@Google Blog. Retrieved 2013-05-16. We’ve already developed some quantum machine learning algorithms. One produces very compact, efficient recognizers -- very useful when you’re short on power, as on a mobile device. Another can handle highly polluted training data, where a high percentage of the examples are mislabeled, as they often are in the real world. And we’ve learned some useful principles: e.g., you get the best results not with pure quantum computing, but by mixing quantum and classical computing. ^ "NSA seeks to build quantum computer that could crack most types of encryption". Washington Post. January 2, 2014. ^ Ambainis, Andris; Wang, Z.; Job, J.; Boixo, S.; Isakov, S. V.; Wecker, D.; Martinis, J. M.; Lidar, D. A.; Troyer, M. (2014). "Defining and detecting quantum speedup". Science. 345 (6195): 420–424. arXiv:1401.2910v1. doi:10.1126/science.1252319. PMID 25061205. ^ "Quantum Chaos: After a Failed Speed Test, the D-Wave Debate Continues". Scientific American. 2014-06-19. ^ Gaudin, Sharon (23 October 2014). "Researchers use silicon to push quantum computing toward reality". Computer World. 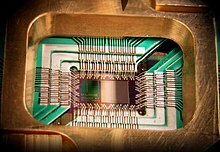 ^ "IBM achieves critical steps to first quantum computer". www-03.ibm.com. 29 April 2015. ^ Hensen, B. "Loophole-free Bell inequality violation using electron spins separated by 1.3 kilometres". Nature. ^ Condliffe, Jamie. "World's First Silicon Quantum Logic Gate Brings Quantum Computing One Step Closer". ^ "3Q: Scott Aaronson on Google's new quantum-computing paper". MIT News. Retrieved 2016-01-05. ^ Ambainis, Andris (2015). "Benchmarking a quantum annealing processor with the time-to-target metric". arXiv:1508.05087 [quant-ph]. ^ "IBM Makes Quantum Computing Available on IBM Cloud to Accelerate Innovation". May 4, 2016. Retrieved May 4, 2016. ^ MacDonald, Fiona. "Researchers have built the first reprogrammable quantum computer". ScienceAlert. Retrieved 8 August 2016. ^ "A new Type of Quantum Bit". www.unibas.ch. ^ "IBM Builds Its Most Powerful Universal Quantum Computing Processors". 17 May 2017. Retrieved 17 May 2017. ^ Reynolds, Matt. "Quantum simulator with 51 qubits is largest ever". New Scientist. Retrieved 23 July 2017. ^ "IBM Pioneers New Approach to Simulate Chemistry with Quantum Computing". 13 September 2017. Retrieved 13 September 2017. ^ Pednault, Edwin; Gunnels, John A; Nannicini, Giacomo; Horesh, Lior; Magerlein, Thomas; Solomonik, Edgar; Wisnieff, Robert (16 October 2017). "Breaking the 49-Qubit Barrier in the Simulation of Quantum Circuits". arXiv:1710.05867 [quant-ph]. ^ "Key component for quantum computing invented: University of Sydney team develop microcircuit based on Nobel Prize research". ^ "IBM Announces Collaboration with Leading Fortune 500 Companies, Academic Institutions and National Research Labs to Accelerate Quantum Computing". 14 November 2017. Retrieved 14 December 2017. ^ Microsoft Mechanics (11 December 2017). "Microsoft Quantum Development Kit: Introduction and step-by-step demo" – via YouTube. ^ Temperton, James (26 January 2017). "Got a spare $15 million? Why not buy your very own D-Wave quantum computer". Wired. Retrieved 13 May 2018. ^ Will Knight (2017-11-10). "IBM Raises the Bar with a 50-Qubit Quantum Computer". MIT Technology Review. Retrieved 2017-12-13. ^ Hsu, Jeremy (January 9, 2018). "CES 2018: Intel's 49-Qubit Chip Shoots for Quantum Supremacy". Institute of Electrical and Electronics Engineers. Retrieved July 5, 2018. ^ Susan Curtis (2018-03-06). "Google aims for quantum supremacy". PhysicsWorld. Retrieved 2018-09-12. ^ Tom Simonite (2018-05-19). "Google, Alibaba Spar Over Timeline for "Quantum Supremacy"". Wired. Retrieved 2018-09-12. ^ Giles, Martin (February 15, 2018). "Old-fashioned silicon might be the key to building ubiquitous quantum computers". MIT Technology Review. Retrieved July 5, 2018. ^ Forrest, Conner (June 12, 2018). "Why Intel's smallest spin qubit chip could be a turning point in quantum computing". TechRepublic. Retrieved July 12, 2018. ^ "World-first quantum computer simulation of chemical bonds using trapped ions: Quantum chemistry expected to be one of the first applications of full-scale quantum computers". ScienceDaily. Retrieved 2018-08-13. ^ Mandelbaum, Ryan F. "This Could Be the Best Quantum Computer Yet". Gizmodo. Retrieved 2018-12-24. ^ "IBM Unveils World's First Integrated Quantum Computing System for Commercial Use". IBM. 8 January 2019. Retrieved 14 January 2019. ^ "IBM unveils its first commercial quantum computer". Tech Crunch. 8 January 2019. Retrieved 14 January 2019. ^ Magazine, Wallpaper* (2019-01-08). "IBM collaborates with British designers to create first standalone quantum supercomputer". Wallpaper*. Retrieved 2019-02-18. ^ a b Bernstein, Ethan; Vazirani, Umesh (1997). "Quantum Complexity Theory". SIAM Journal on Computing. 26 (5): 1411–1473. CiteSeerX 10.1.1.144.7852. doi:10.1137/S0097539796300921. ^ Ozhigov, Yuri (1999). "Quantum Computers Speed Up Classical with Probability Zero". Chaos, Solitons & Fractals. 10 (10): 1707–1714. arXiv:quant-ph/9803064. Bibcode:1998quant.ph..3064O. doi:10.1016/S0960-0779(98)00226-4. ^ Ozhigov, Yuri (1999). "Lower Bounds of Quantum Search for Extreme Point". Proceedings of the London Royal Society. A455 (1986): 2165–2172. arXiv:quant-ph/9806001. Bibcode:1999RSPSA.455.2165O. doi:10.1098/rspa.1999.0397. ^ Aaronson, Scott. "Quantum Computing and Hidden Variables" (PDF). Abbot, Derek; Doering, Charles R.; Caves, Carlton M.; Lidar, Daniel M.; Brandt, Howard E.; Hamilton, Alexander R.; Ferry, David K.; Gea-Banacloche, Julio; Bezrukov, Sergey M.; Kish, Laszlo B. (2003). "Dreams versus Reality: Plenary Debate Session on Quantum Computing". Quantum Information Processing. 2 (6): 449–472. arXiv:quant-ph/0310130. doi:10.1023/B:QINP.0000042203.24782.9a. hdl:2027.42/45526. Ambainis, Andris (1998). "Quantum computation with linear optics". arXiv:quant-ph/9806048. Ambainis, Andris (2000). "The Physical Implementation of Quantum Computation". Fortschritte der Physik. 48 (9–11): 771–783. arXiv:quant-ph/0002077. doi:10.1002/1521-3978(200009)48:9/11<771::AID-PROP771>3.0.CO;2-E.
Dibyendu Chatterjee; Arijit Roy (2015). "A transmon-based quantum half-adder scheme". Progress of Theoretical and Experimental Physics. 2015 (9): 093A02(16pages). Bibcode:2015PTEP.2015i3A02C. doi:10.1093/ptep/ptv122. Benenti, Giuliano (2004). Principles of Quantum Computation and Information Volume 1. New Jersey: World Scientific. ISBN 978-981-238-830-8. OCLC 179950736. DiVincenzo, David P. (1995). "Quantum Computation". Science. 270 (5234): 255–261. Bibcode:1995Sci...270..255D. CiteSeerX 10.1.1.242.2165. doi:10.1126/science.270.5234.255. Table 1 lists switching and dephasing times for various systems. Feynman, Richard (1982). "Simulating physics with computers". International Journal of Theoretical Physics. 21 (6–7): 467–488. Bibcode:1982IJTP...21..467F. CiteSeerX 10.1.1.45.9310. doi:10.1007/BF02650179. Hiroshi, Imai; Masahito, Hayashi (2006). Quantum Computation and Information. Berlin: Springer. ISBN 978-3-540-33132-2. Jaeger, Gregg (2006). Quantum Information: An Overview. Berlin: Springer. ISBN 978-0-387-35725-6. OCLC 255569451. Nielsen, Michael; Chuang, Isaac (2000). Quantum Computation and Quantum Information. Cambridge: Cambridge University Press. ISBN 978-0-521-63503-5. OCLC 174527496. Keyes, R. W. (1988). "Miniaturization of electronics and its limits". IBM Journal of Research and Development. 32: 84–88. doi:10.1147/rd.321.0024. Moore, Gordon E. (1965). "Cramming more components onto integrated circuits". Electronics Magazine. Singer, Stephanie Frank (2005). Linearity, Symmetry, and Prediction in the Hydrogen Atom. New York: Springer. ISBN 978-0-387-24637-6. OCLC 253709076. Stolze, Joachim; Suter, Dieter (2004). Quantum Computing. Wiley-VCH. ISBN 978-3-527-40438-4. Ambainis, Andris; Chakrabarti, Bikas K. (2008). "Quantum Annealing and Analog Quantum Computation". Rev. Mod. Phys. 80 (3): 1061–1081. arXiv:0801.2193. doi:10.1103/RevModPhys.80.1061.